Silky smooth homemade nacho cheese with no processed velveeta cheese. Very easy to make with minimal and simple ingredients. 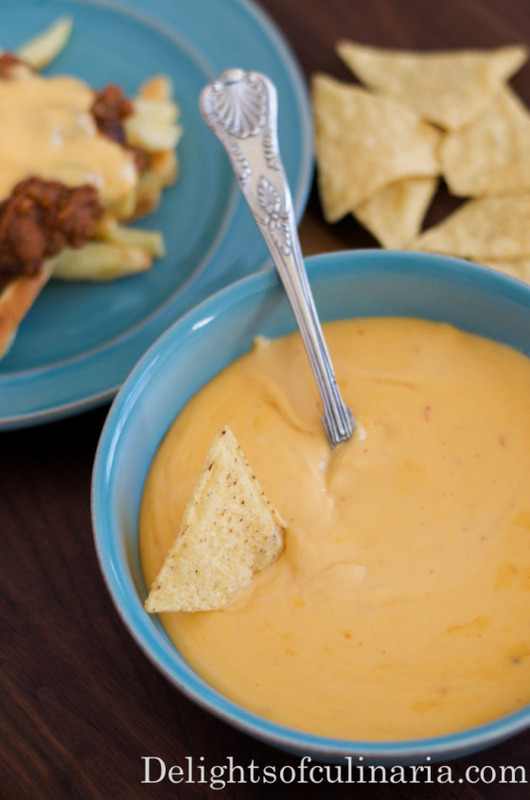 You can adjust the heat of nacho cheese sauce by using only peper jack cheese for hot,cheddar cheese only for mild, and both cheeses for medium. You can also add jalapeños for extra hot. Serve it as a dip with tortilla chips, pour it over chili or chili cheese fries ( one my favorite junkies in my teen years ). In a medium-sized saucepan,toss together cheese and cornstarch, until evenly coated. Stir in 1 cup evaporated milk, the hot sauce and salt. Cook, stirring often, over medium-low heat until thickened, smooth and bubbly. Stir in additional evaporated milk, if needed, until desired consistency. What a great idea making your own. It’s better and healthier too. Thank you Nadia! Oh wow!!! Love everything in this cheese! Totally gonna make it for nachos night. We don’t have it often but it’s yummy when we do. & this cheese will make our nachos over the top! Thank you Nadia!